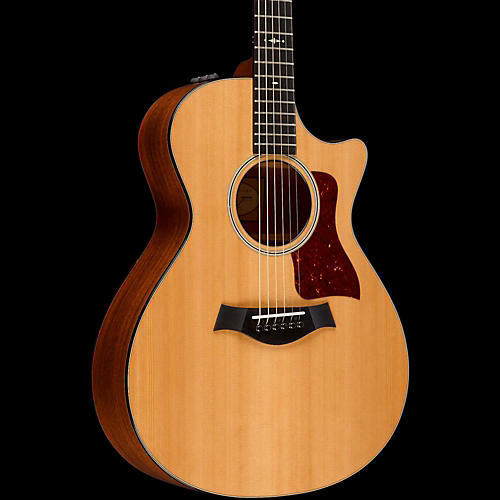 Overview Taylor's revitalized 500 Series mahogany guitars are brimming with appealing refinements, starting with new bracing that boosts the volume, low-end richness and projection, while also making the guitars more responsive. Western Red Cedar tops respond with warmth and richness. Refined aesthetic appointments add to the elegant charm of these models. All 500 Series instruments ship in a deluxe hard shell case made by Taylor for optimal fit and protection. Taylor's Grand Concert is slightly smaller that its Grand Auditorium and yields controlled overtones, so the sound won't occupy a lot of sonic space. This is often a key consideration when other instruments are in the mix, such as in a performance or recording environment, and it allows the guitar to be heard more clearly. The Grand Concert pairs well with both 14-fret and 12-fret neck-to-body construction, and offers an articulate voice with top-end chime. It's perfect for fingerstyle players and light strummers, though flatpickers are known to enjoy its tonal character too. Its intimate size makes it lap/couch-friendly, and a great fit for players who find smaller instruments more physically comfortable. A guitar's top is the primary filter and distributor of vibrating string energy through the guitar, which means it has a huge impact on its sound. Western Red Cedar is less dense than spruce and as a result produces a warm, played-in sound. It's midrange bloom adds a nice complexity to the guitar's tone, and it responds best to a lighter picking/strumming attack. Tropical mahogany is known for a meaty midrange featuring a strong fundamental without adding a lot of ringing overtones. It responds well to players with a strong attack who like dry, earthy, lo-fi sounds. It has a natural compression that smooths out strumming and picking technique. Mahogany's clear and direct tonal character makes it a great option for playing and standing out among other instruments. The location of the sensors enables a more dynamic range of acoustic sound to be captured than ever before while playing plugged-in. Together with Taylor’s custom-designed “professional audio”-grade preamp, this system produces exceptional amplified tone and responsiveness. On stage through a PA, plugged into your favorite acoustic amplifier, or direct into recording software, the Expression System 2 faithfully conveys the voice of your Taylor guitar. The Taylor Expression System 2 operates through a proprietary 9-volt battery compartment and easy-to-use volume, bass and treble controls. The smaller body and 24-7/8-inch-scale neck make for an intimate playing experience. Performance bracing inside the guitar is optimized for the Grand Concert shape, helping to elicit more power, volume and a broadened dynamic range.